Any triangle can be seen as one half of a parallelogram in three different ways: one may create an identical copy of the triangle by rotating the latter through 180° in the midpoint of one of the sides. The two triangles form then a parallelogram with the same base as the original triangle and the same altitude. The product of the base and the altitude is known to be the area of the parallelogram; which is naturally twice the area of the triangle. 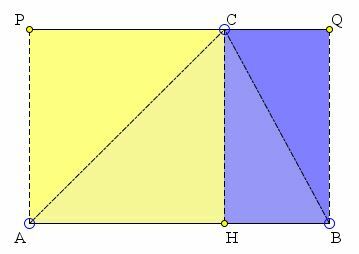 Euclid (I.37) employed this reasoning to establish that two triangles that share the base and the altitude have equal areas. For some reason it is now customary to compare the area of a triangle with that of a rectangle with the same base and altitude. (This is the approach that is being promoted by the NCTM Illuminations site.) Usually the study is restricted to the case where the foot of the altitude falls inside the base (or at an end point.) The case where the apex projects outside the base is commonly omitted. The applet below makes use of the transparent colors to hopefully make the situation more transparent in all possible cases. and Area( ΔABC) = Area(ABQP)/2. It appears that although this approach may not be appropriate for an early encounter with geometry, it provides a natural example for a more mature discussion of shape orientation and signed quantities. I wonder how much of the box the triangle takes up? Two-thirds maybe? The important thing to understand is that I'm not talking about this drawing of a triangle in a box. Nor am I talking about some metal triangle forming part of a girder system for a bridge. There's no ulterior practical purpose here. I'm just playing. That's what math is - wondering, playing, amusing yourself with your imagination. For one thing, the question of how much of the box the triangle takes up doesn't even make any sense for real, physical objects. Even the most carefully made physical triangle is still a hopelessly complicated collection of jiggling atoms; it changes its size from one minute to the next. That is, unless you want to talk about some sort of approximate measurements. Well, that's where the aesthetic comes in. That's just not simple, and consequently it is an ugly question which depends on all sorts of real-world details. Let's leave that to the scientists. The mathematical question is about an imaginary triangle inside an leave that to the scientists. The mathematical question is about an imaginary triangle inside an imaginary box. The edges are perfect because I want them to be - that is the sort of object I prefer to think about. This is a major theme in mathematics: things are what you want them to be. You have endless choices; there is no reality to get in your way. On the other hand, once you have made your choices (for example I might choose to make my triangle symmetrical, or not) then your new creations do what they do, whether you like it or not. This is the amazing thing about making imaginary patterns: they talk back! The triangle takes up a certain amount of its box, and I don't have any control over what that amount is. There is a number out there, maybe it's two-thirds, maybe it isn't, but I don't get to say what it is. I have to find out what it is. So we get to play and imagine whatever we want and make patterns and ask questions about them. But how do we answer these questions? It's not at all like science. There's no experiment I can do with test tubes and equipment and whatnot that will tell me the truth about a figment of my imagination. The only way to get at the truth about our imaginations is to use our imaginations, and that is hard work. If I chop the rectangle into two pieces like this, I can see that each piece is cut diagonally in half by the sides of the triangle. So there is just as much space inside the triangle as outside. That means that the triangle must take up exactly half the box! This is what a piece of mathematics looks and feels like.